This is Midfi Electronics “Random Number Generator”. It’s a radical fuzz that adds oscillation notes that randomly arpeggiate off of the fundamental note played. Crazy noise maker pedal. I’ve built several of these now by request. 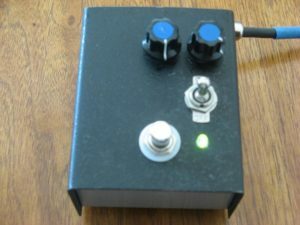 The owner of the design over at Midfi was gracious enough to share the schematic on the DIYstompboxes forum which is why I want to make it clear that this is NOT my design, and if you get one for me you are strictly paying me to make a clone since these aren’t available anymore. This is the first one of these I’ve built. I added the mods of changing a 100k resistor with a pot, and a diode that is switched into the circuit, but quite frankly they don’t do a whole lot. Any others of these I build will just have the volume knob as original intended.